One far-left deputy minister suggested snap elections as a way out, by obtaining public legitimacy for difficult decisions to secure aid. But Tsipras made no mention of elections in an address that focused on attacking the aid plan offered by euro zone and IMF creditors. He was speaking after Athens delayed a 300 million euro payment due to the IMF on Friday, a highly unusual step that rattled financial markets and sent Greek stocks .ATF down 5 percent but that does not yet signal a formal default. But the lenders’ proposal crosses many of Tsipras’s ‘red lines,’ including hiking taxes, privatizing strategic assets and cutting benefits for poor pensioners. Tsipras instead called on lenders to accept Greece’s proposal sent this week that would reverse labor and pension reforms, calling it the only “realistic” proposal on the table. In what appeared to be a threat that Greece was prepared to move unilaterally if its demands were not met, Tsipras said the government would legislate the restoration of collective bargaining rights for Greek workers, a move lenders oppose. On Friday the government decided to bundle together some 1.6 billion euros it is scheduled to pay the IMF in June into a single payment at the end of the month, skipping a 300 million euro payment due on Friday. It was the first time in five years of crisis that Greece has postponed a repayment on its 240 billion euro bailouts from euro zone governments, the European Central Bank and the IMF. The IMF said the maneuver was unorthodox but permissible. Deputy Social Security Minister Dimitris Stratoulis, from the far left of the ruling Syriza party, made clear the decision was a negotiating tactic. “The government’s move is a message that it wants to wait and see how far they (lenders) will take it, if they will back off from this unreasonable, inhumane, colonialist package they are proposing,” he said. Yields on Greek two-year bonds soared nearly three percentage points to over 25 percent, and lower-rated euro zone bonds also headed higher in a sign of growing market unease. 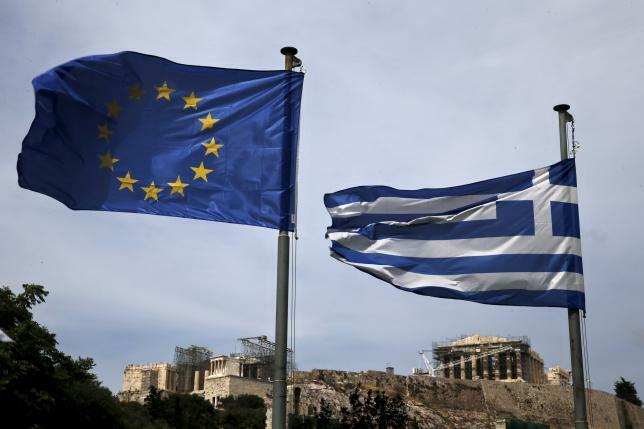 Many analysts expect a last-minute aid deal that would avert a Greek exit from the euro but say the coming weeks could see further ructions in Greek politics, keeping markets on edge. “Fasten your seat belts for what could be a rough ride in Greece,” said Berenberg Bank chief economist Holger Schmieding. Time is running out to clinch a deal and get further disbursements approved by EU national parliaments, some of which have appeared reluctant to offer Greece much budget slack, before the bailout program expires. Europe’s big powers and the United States have grown increasingly concerned about the unpredictable outcome as Greek cash reserves dwindle down toward zero.